Pretty much the only “gardening” I’m doing now is thumbing through the seed catalogs arriving in dribs and drabs in my mailbox. Among the funnest of these catalogs, and strictly for the plant-crazed, is “The 2011 Ethnobotanical Catalog of Seeds,” which, until I checked, I always called Hudson’s Seed Catalog. The catalog originates in the Santa Cruz mountains of California (once home to Ken Kesey) but offers seed from all corners of the world. Only recently have they come online, at www.jlhudsonseeds.net. I’ve ordered from this catalog for decades, each winter pleasurably and slowly wading through the almost 100 black-and-white pages of small print listings of botanical names and descriptions. 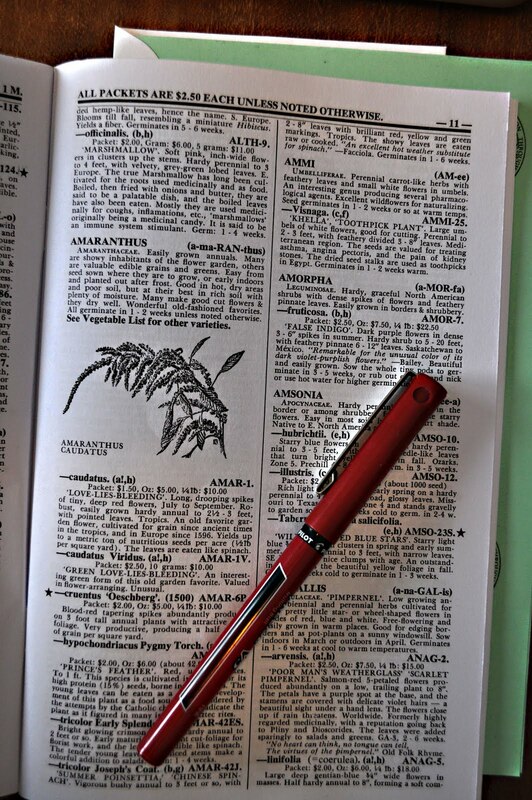 For this first run through the catalog, I sit poised with red pen, ready to make a star next to any seed listing that looks particularly interesting. After I go through the whole catalog once, I’ll re-examine all those starred listings and select which seeds to actually order and grow. Another is Adenophora lilifolia, also known as ladybells. This one is described as “sweet-scented light blue 1/2″ wide bell-shaped nodding flowers borne profusely in summer. Very hardy perennial to 1 1/2 – 3 feet, with round, heart-shaped basal leaves. Eurasia. Cultivated in Japan for the thick, edible roots. Germinates in 2 weeks.” For only $2.50 a seed packet, oodles of each of these plants can be growing in and perfuming my backyard this summer. So far, I’ve only gotten as far as “D” in the seed listings. There’s still time. Aren’t temperatures supposed to get colder and colder and colder until the end of this month, and then get warmer and warmer and warmer? Unfortunately for plant lovers here, that’s how temperatures generally trend in coastal regions, near large bodies of water, and in western Europe. In my garden, the low was 6 degrees a couple of weeks ago and the high was 56 degrees a few days ago. Such fluctuations — characteristic of a continental climate — are not that uncommon over much of the continental U.S. If you don’t like winter, you welcome those balmy winter days; if you like winter and/or like plants, those balmy days make you shudder. Plants that can take our cold weather like the weather to stay cold all winter. Each time temperatures warm, especially after we’ve had a spell of cool weather, these plants start to awaken slightly from their winter slumber. The closer to spring and the warmer the weather, the more they awaken. Problem is that the more awake a plant is, the more likely damage, even for a cold-hardy plant, from subsequent frigid weather. All this makes a good case for growing native plants. They’re used to our mercurial weather and know better than to let a winter warm spell entice them out of their slumber. However, many cultivated plants are not native. I like to grow fruits, and fits of warm weather in weeks to come are going to make me nervous about the apples, plums, hardy kiwis, and pears, all non-native and sometimes awakening early enough to be damaged by subsequent cold. The blueberries, pawpaws, persimmons, raspberries, and mulberries should be fine. Let’s hope for steadily cold weather and plenty of snow for the rest of winter. I’m a big fan of Bakers Creek; they have a pretty extensive catalog and the print version has beautiful photographs.